Sadness, in this case induced by watching a heart-wrenching video, can make us desperate to buy! buy! buy! Deep loneliness can lead to chronic Grinch syndrome. Companies are exploiting neuroscience research into obsession and games to induce us to join, befriend, and play. Especially good news for those of us who live in the northern latitudes, our ‘little grey cells’ in for a sort of ‘perfect storm’ of neuro-chemical havoc at this time of year. ~ from What does Christmas do to your brain? External conditions and behavioural choices at this time of year can lead to changes in brain/body chemistry including: SADD, chronic inflammation, “brain hyperexcitability,” ” low-alpha state resulting in attention-span issues and an inability to concentrate when you return to work,” stress-induced cortisol overload which impairs your memory and ability to multi-task. Aren’t any brain scientists out there interested happiness, joy, fulfillment, or contentment? If you know of any research into why Christmas is such a wonderful time of year, please send it my way. Meanwhile, my Christmas wish for you is to take some time to have fun and (even better) to enjoy a good Santa-like laugh that makes you shake all over like a bowl full of jelly. According to Neuroscience for Kids, laughter has been shown to cause positive changes in the autonomic nervous system, to provide a boost to the immune system, and to reduce levels of stress hormones and neurotransmitters including: cortisol, growth hormone, and catecholamines (dopamine, norepinephrine, and epinephrine). I guess Reader’s Digest did have it right: laugher is the best medicine. The American Youth Circus Organization (AYCO) Biennial Meeting was August 17-20 in sweltering 95o, 95% humidity Sarasota, FL with no air conditioning, but the 300 kids from all over the US who worked their butts off from dawn to dusk were not deterred in the least by the heat and humidity. They were having the time of their lives. 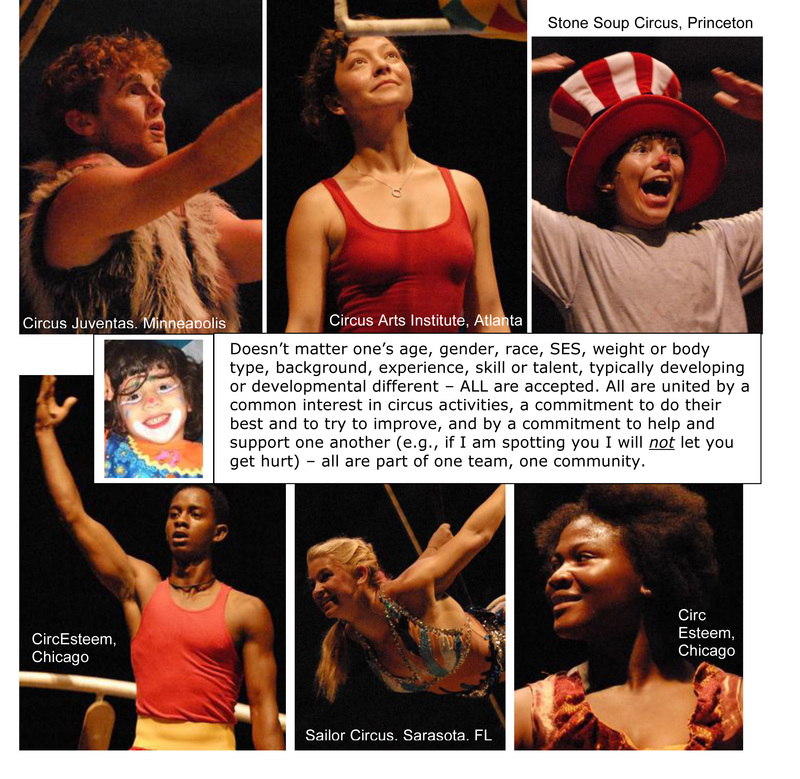 BDL Conference Organizer, Adele Diamond, went to AYCO Meeting to learn about Youth Circus. 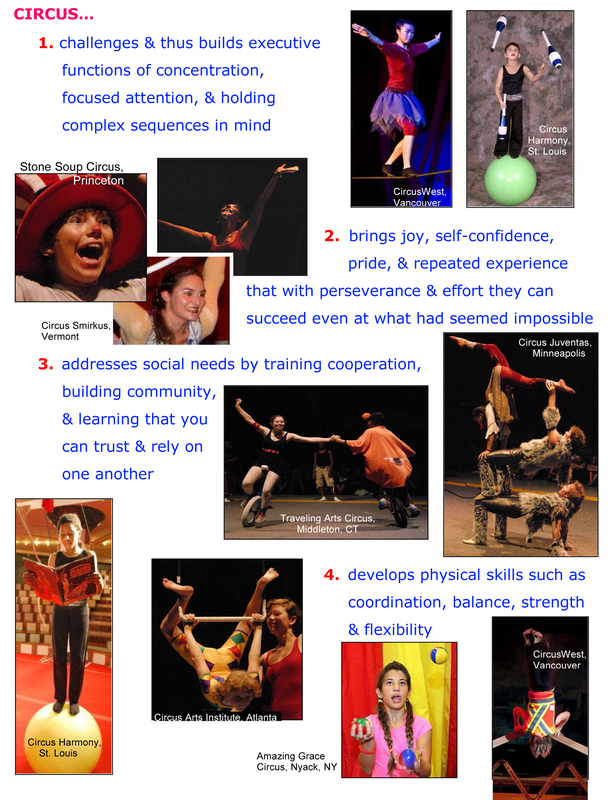 Amazing Grace Circus of Nyack, NY says youth circus is about building “Confidence. Imagination. Respect. Cooperation. Understanding. & Success” (CIRCUS). If addressing all parts of the child is critical for children to excel in school and in life, then might programs like youth circus be important for academic success?